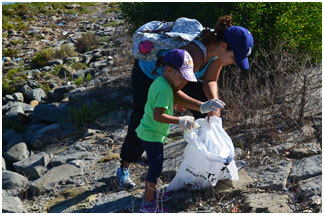 Coastal Cleanup Day is the world’s largest volunteer event with hundreds of thousands of people participating globally to help pickup trash and debris from local beaches, waterways, and lakes. On September 19th, 2015 EcoKai staff joined the Friends of Ballona Wetlands, Heal The Bay, and many wonderful volunteers in the cleanup of the Ballona Wetlands Ecological Reserve. 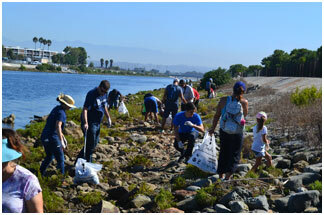 The volunteers were split into two groups: EcoKai joined the group along the Ballona Creek, while the other group composed primarily of local school children participated in the removal of invasive ice plant (Carpobrotus edulis) away from the water shore but within the wetlands. By the end of the day 150 pounds of trash and debris had successfully been removed and it was a truly incredible experience to see so many people of all ages donating their time and effort to help sustain Los Angeles’s important wetland ecosystem. As SAVE THE DATE - Remember to sign up for Coastal Cleanup Day next year (September 17th, 2015), and continue to help keep our water bodies clean.